These were made with homemade vanilla pudding. See recipe below. So, the staff at the school I work at decided to have a "Souper Bowl" party today, to which I decided to take my delicious Chicken Pot Pie Soup. As usual, I overdid it on the pie crust pieces that are served with the soup. I brought home almost a full recipe of pie crust because I had doubled it. I ALSO happened to have some vanilla pudding in the fridge because I made Nanaimo Bars for the fourth graders I teach, and my son wanted to make pudding out of the leftover vanilla pudding powder. 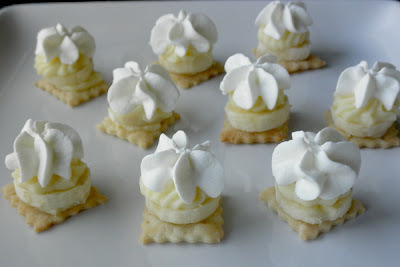 Of course, I always have bananas and heavy cream in my house, so I decided to see what would happen if I put all of these items together into cute bite-sized banana cream pie. They're actually more like two bites of banana cream pie, but they're so cute, and so yummy. I don't know if I'll ever make them again, and the recipe is my best guess at amounts. If nothing else, perhaps this will inspire me and others to try other bite-size versions of pies with leftover pie crust. *Update 3/11/12: The Bite Size Chocolate Cream Pies were a success. *Update 4/7/12: Bite Size Coconut Cream Pies also a success. *Update 4/30/12: Three Bite Chocolate French Silk Pies are a tie with these banana cream pie bites for my favorite of the bite size pies. Whip heavy cream and powdered sugar into stiff peaks. Using either a pastry bag with an open star tip, or using a zip-top bag with about 1/4 inch of a corner cut off, pipe about half a teaspoon of chilled pudding onto each pie crust piece. Place a slice of banana on top of the dab of pudding. Then squeeze about 1 1/2 teaspoons of pudding onto each banana slice. Refrigerate the pies while you prep the whipped cream into another pastry bag (or the same one with the tip washed), and then pipe about 1 1/2 teaspoons of whipped cream onto each pie. Refrigerate until ready to serve. Makes...um...I'm not sure, but I'd guess about 3 dozen bite-size pies. *You can also use stabilized whipped cream instead of the whipped cream and powdered sugar, if you want them to stay pretty longer. custard. Refrigerate until completely chilled. In a medium bowl, mix flour and salt. Cut 4 T butter into flour until it looks like coarse meal, and then cut in Crisco until well blended. Add ice cold water and stir with fork. Then use your hands to gently work the dough into a ball. Flour a rectangular sheet of wax paper, place dough ball in the middle, flour the ball, and cover with another rectangular sheet of wax paper. Roll dough out to a thickness of about 1/8”. With a sharp knife or pizza cutter, cut dough roughly into 1.5”x 1.5” squares. You can also be creative and use cookie cutters to make cute shapes. Place dough pieces on a parchment-lined cookie sheet. Prick each piece a few times with a fork. Bake at 400°F for 11-13 minutes, or until browned on the edges. Remove from oven. Cool completely before using for bite-size pies. These are absolutely adorable! I am so making these for Easter! Thanks for the recipe! I have not tried Nilla Wafers, but I think they would work fine. You'd end up with something sweeter than with the pie crust though. What a great idea for leftover pie crust!!!!! They're cute and delicious, I'm sure! I found this recipe through pinterest, and just got done making them. They turned out so cute! Thanks for taking the time to post this recipe! Want the banana's turn brown? The bananas don't turn brown if you eat them within like 8 hours of making them, but even the leftovers don't get as brown as you'd think. I love this idea! Thanks so much for the inspiration! You know I dream about things like this. Thank you so much. You're funny, Anne. You are welcome. I, too, dream about these things. I'm going to make these and the chocolate cream pie today.Question....Does the banana stay fresh in the fridge?? No turning brown? 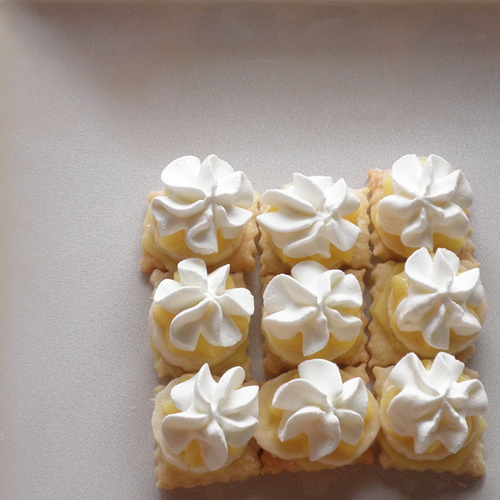 I was wondering if you've tried Lemon Meringue pie yet? Einygav, funny you should ask this today. I just made some and they're sitting in my refrigerator. The bananas I used today are slightly under-ripe for my taste. They're ripe enough, but not quite as flavorful as I normally like. They've been in the refrigerator for almost 3 hours, and they aren't browning yet. I've only tried the banana cream and chocolate cream so far. 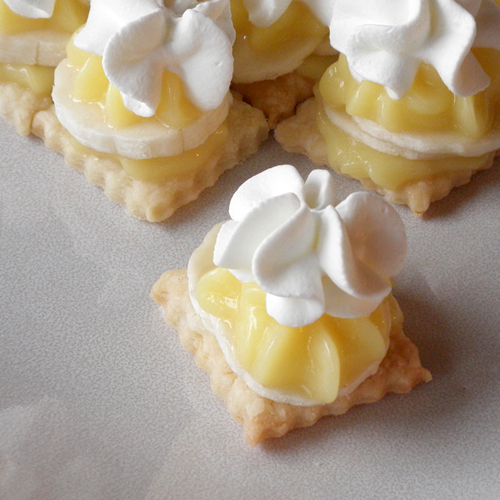 I think lemon meringue would look great, but to tell the truth, I've never even eaten that kind of pie. I just might try it in this little form, though. Have you tried any other kind of crust like vanilla wafers or maybe sugar cookie dough and make them small. Pie crust sounds kind of hard or time consuming. They're so cute though and I want to make them. I have not tried any other kind of crust. I stick with the pie crust because I'm a "salty-sweet" fan, so the crust sort of cuts the sweetness of the vanilla pudding. I know there are refrigerated pie crusts available (Pillsbury--http://www.pillsbury.com/Products/Pie-- and store brand) that are just flat pieces of crust that would be easy to bake up. If I were going to go the cookie route, though, I would probably TRY vanilla wafers, or I would buy some Golden Oreos, remove the filling, and use those wafers. Just an idea. I think maybe I need to try one of those soon, just so I can post about it. Let me know if you try one. 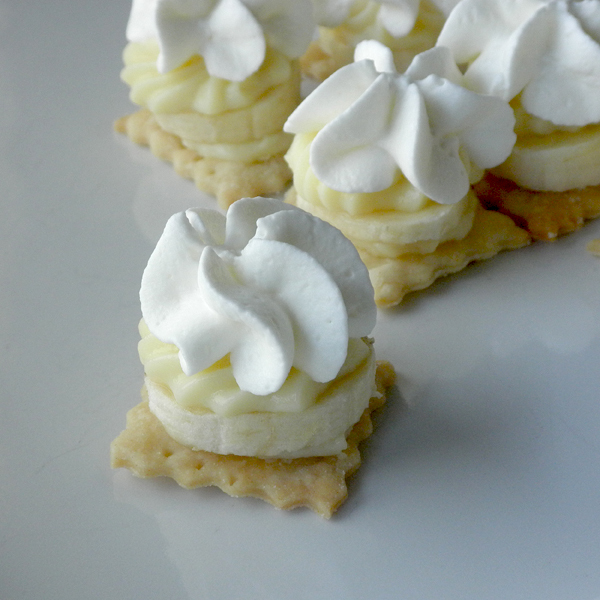 YUMMmmm...I'm not a lover of a huge piece of banana cream pie, but these? ...I think I can handle :) I'm with you on the sweet-salty taste. Will definitely be trying these sweet gems! I do alot of bake sales for fundraising and I'm gonna try these. seems like people are more inclined to buy something that is sold individually, rather than something that needs to be cut and put on a plate. thanks for the wonderful idea! You're welcome, Leann. :) Let me know how they sell. I'm curious. Had same idea, use vanilla wafer instead of pie crust if one is in a hurry. Also, put each of the mini-pies on a muffin paper on a tray for serving. One can scruntch them tightly together, but, can't double stack. Can use a lazy susan type with 2-3 heights for serving. Thanks much, you really set us all to thinking!